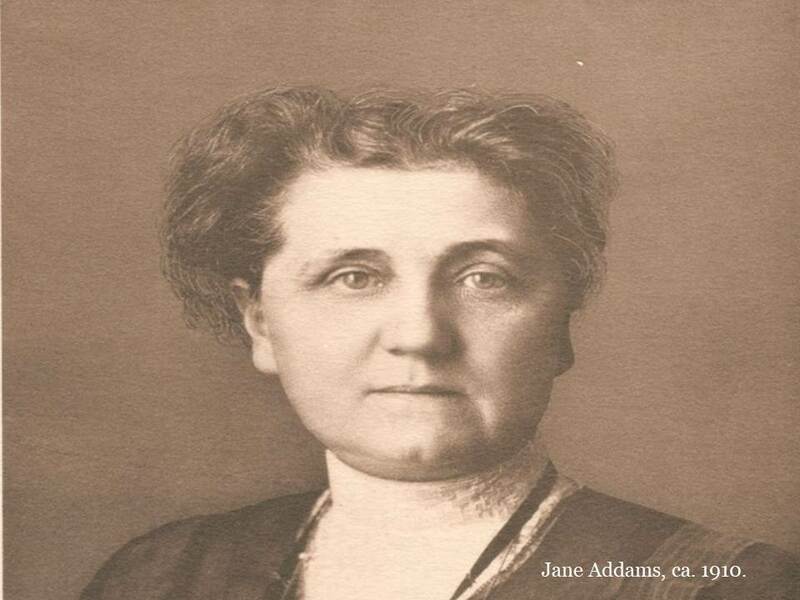 Laura Jane Addams was born on September 6, 1860 in Cedarville, Illinois. She was the daughter of John Huy Addams, a wealthy businessman and Republican politician, and Sarah Weber Addams. She was the youngest of five children. Her mother died when she was only two years old and her father married Anna Haldeman, a widow with two sons of her own. 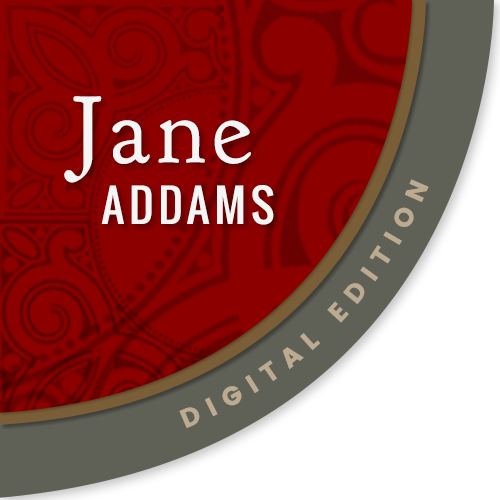 John Addams was a profound influence on Jane Addams’s upbringing, teaching her religious, liberal, and republican principles about rights and responsibilities. He served as a state senator and was a supporter of Abraham Lincoln. Jane Addams was part of the first generation of American women who studied at college. She attended the Rockford Female Seminary, and was a member of the first class awarded the bachelor’s degree. Addams excelled at Rockford, she was the class valedictorian, made lasting friendships, and discovered her drive to do something for society. After graduation she found few opportunities and floundered for a few years, trying the Women’s Medical College of Philadelphia, but health problems and family demands derailed her. She toured Europe several times, onee with her stepmother and later with Ellen Gates Starr, a fellow Rockford alumna, in 1888. Addams and Starr visited Toynbee Hall, a London-based settlement run Rev. Samuel Barnett and his wife Henrietta Barnett, where university men lived in a slum neighborhood and helped their neighbors. Inspired to start their own settlement house in Chicago, Addams and Gates opened Hull-House in Chicago’s 19th Ward in 1889. Hull-House was an innovative community center that provided a wide range of services and classes for the neighborhood’s working class residents. Though it wasn’t the first settlement in the United States, it became the most well-known and influential, largely due to Addams’ skill at creating a community and communicating the ideals of settlement workers. What made Hull-House different was that Addams and Starr listened to the people that they wanted to help. While they began with ideas of poetry readings, art classes and educational opportunities for the working class, they quickly found that their neighbors needed more practical help -- day care for their children, help learning English, and spaces to hold meetings. Addams argued that the settlement needed to work with their community, listen to its needs and provide what help it could. This was a break with older charity work, where programs were designed for the poor. Hull-House was also unique among settlements because though it was made up of both men and women, it created a unique community where college-trained professional women were able to flourish. Women like Grace Abbott, Florence Kelley, and Alice Hamilton worked with Addams and Starr at Hull-House and brought Progressive ideas for reform to the immediate community and then to the city and nation. Addams used Hull-House as a platform for Progressive reforms. The settlement movement grew rapidly in the United States and elevated public awareness of Addams and her work. She had her hands in many of the major reform movements of the day, child labor reform, sanitation, factory conditions, recreation and safe spaces for children, and efforts to ensure that democracy worked for all, including the poor, immigrant, and female. Along with other settlement workers and Progressive reformers, Addams helped to redefine the role of government in a modern industrial society and helped define the profession of social work. Addams believed strongly in mediation as a way to solve problems. Her insistence on cooperation and compromise was uniquely Addams-- she saw that when people with different perspectives allowed all voices to be heard, a just solution could be achieved. 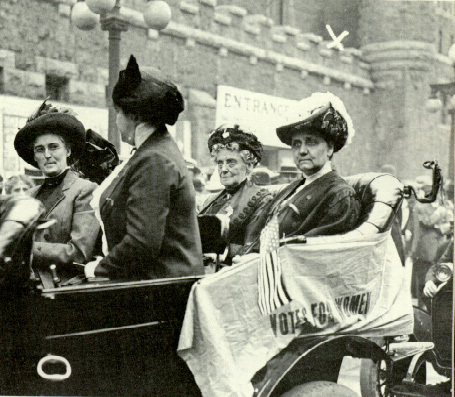 Addams believed in woman suffrage and dedicated her time to lecturing and lobbying for suffrage at the city, state and national level. She was a vice-president of the National American Woman Suffrage Association, and wrote a series of columns for the Ladies Home Journal and other magazines to popularize the idea. In additional to her suffrage work, Addams spoke on a wide range of topics and published many of her lectures in book format. These include Democracy and Social Ethics (1902), Newer Ideals of Peace (1907), The Spirit of Youth and the City Streets(1909), Twenty Years at Hull-House with Autobiographical Notes (1910), and A New Conscience and an Ancient Evil (1912). In 1912, Addams stepped into national politics, supporting the presidential campaign of Theodore Roosevelt on the Progressive Party ticket. Here she found her commitment to compromise tested as she faced opposition from members of the suffrage, peace, and settlement movements over her endorsement. Her commitment to woman suffrage and Progressive reforms convinced her that supporting Roosevelt, despite some of his stances, was the best way to advance change. Addams’ interest in mediation and peace became all-consuming in the second half of her life. 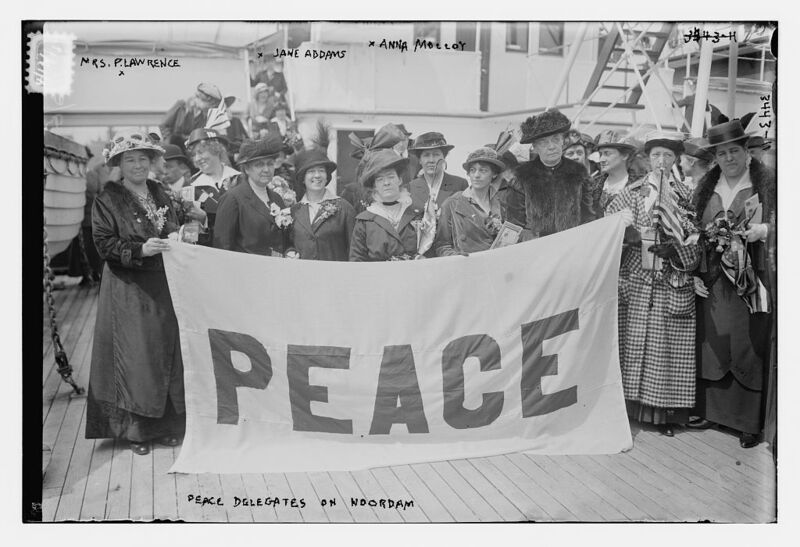 With the outbreak of World War I, Addams worked with peace activists around the world to keep the United States out of the conflict, encourage the United States to help broker peace, and help create conditions for a just peace. Addams, working with the Woman’s Peace Party and the International Congress of Women built both national and international drives to pressure governments and public opinion in favor of negotiation. Theodore Roosevelt, pushing for preparedness, castigated her calls for peace. Despite her efforts, the United States joined the war, and once that happened, Addams was vilified in the press as a traitor to her country, a naive unrealistic reformer, and merely an emotional woman. Even some of her allies at Hull-House distanced themselves from her during the war years as she was tarred as a radical and subversive. Addams continued on despite the name-calling and the loss of popularity. She was named the president of the Women’s International League for Peace and Freedom and presided over six International Congresses of Women from 1915 until her death. Addams traveled the world, inspiring women with the idea that they had a special mission to lead the world to peace. She believed that peace went hand in hand with social justice and representation from all members of society. She was among the co-founders of the American Civil Liberties Union and the National Association for the Advancement of Colored People. Public opinion began shifting back in Addams’ favor and by 1931 she was once again a revered public figure, the first American woman to win the Nobel Peace Prize. Jane Addams never married, and carried on close companionate relationships with Ellen Gates Starr and then Mary Rozet Smith. Addams died on May 21, 1935 from abdominal cancer. In her New York Times obituary, she was remembered as “the world’s best-known and best-loved woman.” (May 22, 1935).